HS2 Ltd appoint the boss of one of their contractors as temporary CEO. The sooner labour come out against hs2 the better off we all will be so we can get rid of the clowns trying to justify this all full idea and save the nation millions of pounds we can not afford . Ben Ruse says “UK does big projects well and always delivers”. Is he thinking of the the NHS IT project maybe? You remember that? It got 100% canned and governments contractors are busy suing govt for their commercial and business incompetence. Or perhaps the Olympics, where Ben has forgotten that the original guestimate was rubbed out once commercial sponsorship failed to arrive, and we ‘successfully’ delivered it for what it ended up costing us once the tax paye stumped up loads more money. As for Crossrail…. I’ve yet to travel on it, and there’s still a huge hole at Tottenham Ct Rd, so saying ‘on time in budget’ means absolutely nothing. That Ben’s own posts are vaguely incoherent and quite disjointed are I’m sure are commensurate with his overall ability and professionalism. He is clearly wildly out of touch with real business in the UK: I no longer commute from London to Birmingham for meetings, instead my company uses NetMeeting – another real-world example that Ben – and Paul Bigland – seem utterly oblivious to. Have you ever worked in the real world, where your salary (and job) is directly linked to results… or have you suckled solely from your govt stipends? and there’s me thinking that Government and HS2 were going to roll over following this summers silly season media stories about HS2…………some of which to be honest were farcical. Question for Stop HS2 – given that Labour has long track record (pardon the pun) of saying one thing about railways to garner votes and then doing another once in power (see Wilson’s pledge to reverse Beeching and Tony Blairs publicly owned and accountable railway) is Ed Balls posturing more than just that? 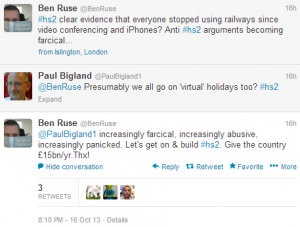 Silence twittering on HS2. It serves no practical purpose. It will not reach the Supreme Court Judges who did not receive the technical guidance required for their assessments. It simply identifies source locations of groups of similar interests and ideas for the focus groups. You are simple providing the agenda for the PR teams. Concentrate on the substantsive issues and bring together the examples where genuine community concerns are. 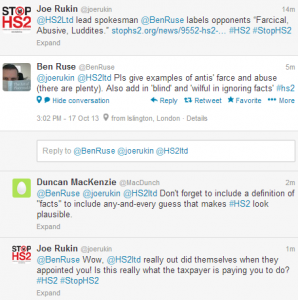 You are being misdirected to the feeds others require from you but you want changes from DFT HS2 and the HMG. The social media is not a tool to assist you out argue the promoters. Twitter less and let those who want to twitter do so for no response. Bletchley rules are needed. Use Buzz media to put forward the facts and the challenges please. 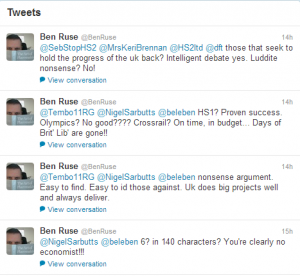 Ben Ruse ‘lead spokesperson for HS2 ltd has behaved in a manner unbecoming and unprofessional. His position should be reviewed. He is not making personal statements whilst using professional time. HIs actions and comments cannot be conveniently divided into personal and professional if there is a huge ethical dilemma between private and professional stance. As an examplar can we accept a ‘privately’ but publicly outspoken racist profesionally working for the equality commission? The direct responsibility for his actions are to be laid at his management in HS2 ltd and the Government Ministers responsible for its governance. Furthermore he is seemingly disseminating false information that directly contradicts legal evidence to the highest court in the land. Either he was unaware of the facts of the case or he has been deliberate in his acts. If the former is his then position as lead spokesperson requires review. This is concerning for 2 reasons. 1) His organizational managers at the at ‘arms length’ ‘independent; but wholly cabinet determined HS2 ltd have both seemingly supported and seeming applauded his actions. Is it part of a deliberate disseminative campaign? certainly it offsets the appalling green and environmental account that HS2 ltd necessarily had to present to the Supreme Court. It is but conjecture (given the lack of transparency at HS2 ltd) but the temporal linkage has proved convenient if it was not an expedient, deliberate ploy. 2) It would be important to know whether the three Ministers now responsible for HS2 were aware, are now aware and by their silence and lack of apology could appear in tacit collusion with such low tactics, lack of comment suggests an approval of the dissemination of material which must be considered false (and deliberately so). Their silence contaminates them. HS2 is in no HS1 and does not adhere to any of the guiding environmental principles. It appears that much has made of plebgate and its ramifications and intrigues. “pleb” is to my mind is a relatively mild perjorative in comparison to ‘farcical abusive (sic) luddites” (environmentally and fiscally concerned members of the public congruent in sentiment with over 50 percent of the population according to polls)…. Can the public trust the police (was a much vaunted political statement yesterday)? The boot is now on the other foot in this case. 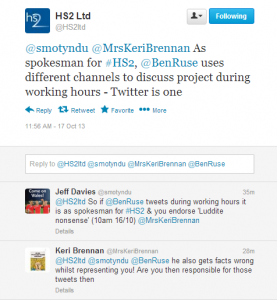 Can the public trust HS2 ltd and their Coalition masters/strategists? HIs actions and comments cannot be conveniently divided into personal and professional if their is a huge ethical dilemma. As an examplar we accept a racist profesionally working for the equality commission? The direct responsibility for his actions are to be laid at his management in HS2 ltd and the Government Ministers responsible for its governance. Furthermore he is seemingly disseminating false information that directly contradicts legal evidence to the highest court in the land. Either he was unaware of the facts of the case or he has been deliberate. If the former then his position as lead spokesperson requires review. 1) His organizational managers at the at ‘arms length’ ‘independent; but wholly cabinet determined HS2 ltd have both seemingly supported and seeming applauded his actions. Is it part of a deliberate disseminative campaign to offset the appalling green and environmental account that was necessary to present to the Supreme Court? 2) It would be important to know whether the three Ministers now responsible for HS2 were aware, are now aware and by their silence and lack of apology could appear tacit collusion with such low tactics and suggest an approval of the dissemination of material which must be considered false (and deliberately so). Their silence contaminates them. It appears that much has made of plebgate and its ramifications and intrigues. “pleb” is to my mind a relatively mild in comparison to ‘farcical abusive (sic) luddites” (environmentally and fiscally concerned members of the public congruent in sentiment with over 50 of the population according to polls)….